Have you heard of golden syrup? Its quite amazing and I hadn't heard of it before this recipe. Well I had heard of it but I had never used it, because I'm in America and it is more of a UK thing. It's kind of like honey, in texture but tastes like liquid gold. This cake is simple and rustic with the greatest frosting. The cake is good, buttery and soft. The frosting is what makes it though. The golden syrup makes it slightly sticky and a much richer flavor than my normal buttercream. One of the reasons I bought the golden syrup was honestly not for the syrup at all but for the can. What classy packaging? I thought. Not like the normal plastic squeezy bottles, white bags and jar with off brand labels I'm used to seeing. So today and tomorrow are my days off. I've planned out, picked out props and started recipe prepping for three different photoshoots to do tomorrow. Well, two are quite simple so hopefully it won't be too much of a task. I can't photograph during the week, too dark when I come home from work, so I cram as much as I can into my days off. Wish me luck! this cake looks delish, I need to try it. That's a beautiful little cake, and while I've seen that beautiful can of syrup, I've never used it in anything. I'm popping out tomorrow to buy some! 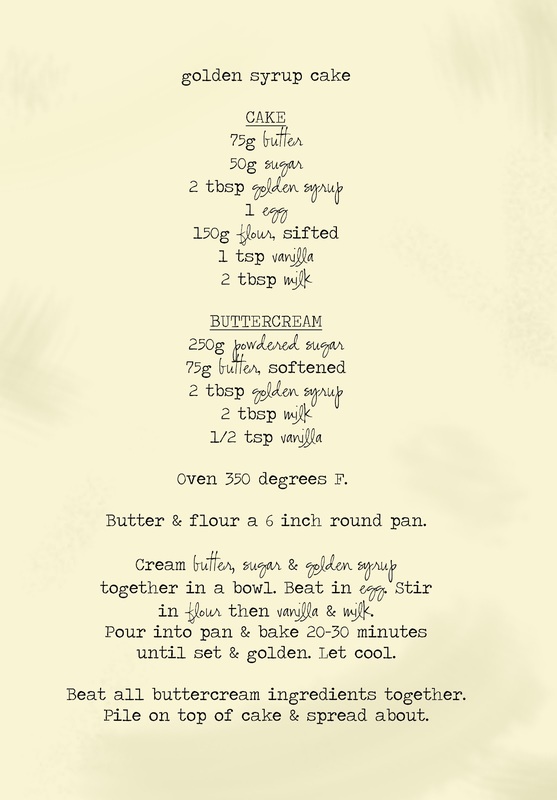 Looks delicious, though golden syrup is more of a New Zealand/Australia thing, too :-) It's nice to see a recipe that calls for it! Oooo I love golden syrup! we always had it on pancakes as kids (used all the time here in Oz, whereas molasses and treacle are rarely used unless making gingerbread!) I can't wait to try this recipe out - it looks gorgeous. I love your photographs, always so visually stunning. Did you use self-rising flour? That. looks. delicious. Clearly I need to try this. I'm in the UK and always have a tin of golden syrup in the cupboard as it really is "liquid gold", and we use it quite often in cakes and cookies etc. I love golden syrup even if it is very hard to stop myself from sneaking spoonfuls when I'm baking with it. The smell of a golden syrup cake baking is so evocative too. I love golden syrup, especially on crumpets with butter! Lovely photos and cake. I live in the US and I've never heard of golden syrup. I'm sure I can find it in an ex-pat store somewhere. :) The texture of your cake looks perfect! I just made this, and unfortunately the cake didn´t rise at all, it came out of the oven looking like a flat pancake. While making it I ended up with a pretty small amount of dough, which pretty much stayed that way after baking. I noticed that the recipe doesn´t include any baking powder - is the dough supposed to rise anyway? It's amazing how sweet it looks!!!! Lovely photos and cake. Yum. Yum. I've seen Nigella use golden syrup and I've wondered about it. I'll have to try it. Does golden syrup go by other names in the grocery store? What is a substitute? Never had this, but now I want to - great styling! Oui j'adore le sirop de maïs dans les glaçages ! Il a le sirop clair et ambré ^_^ Ton gâteau est vraiment beau et surtout il semble trop bon Miam ! Merci pour ce shooting de photos, je les adore ♡ Bonne chance pour la prochaine recette, tu es formidable pour moi et c'est grâce à toi que je suis devenue bloggeuse. I love the buttery light of these photos. They are gorgeous. The cake looks delicious and I love the pictures; they sure say it all. Now if you ever need anyone to sample your great food, I'm there for you. If I've said it once, I've said it a thousand times: Any cake/biscuits with golden syrup in it is ALWAYS gonig to be amazing... I can't belive it's not that common in the states! Oh this looks totally awesome! As a Brit, I've always loved Golden Syrup. I always add it to buttercream, and recently Tat and Lyle have released a chocolate flavour too!!. Def on ice cream! Its perfect on pancakes too & in porridge or on rice pudding! My nan had it in pancakes the other day & she accidently dribbled some onto her trousers - it stuck her knees together, its THAT sticky!! Im going to try your recipe, it looks delicious, thank you! I love golden syrup...you are so right, liquid gold for real! This was the best bakery item for which I was very crazy and I had ever seen it. are you sure you have the recipe right? i just made the cake and it is awful, did you forget to include some ingredients like baking powder? Unfortunately, the original recipe (which I found on Lyle's website) calls for self-rising flour. This makes ALL the difference. I made the cake twice before discovering this. Hopefully third time's a charm when I add baking soda. Beautiful photos! And the flavor is lovely. I love how you can make even a simple cake look like the most decadent and delicious thing in the world. Your photos are gorgeous! I can only find golden syrup here in a couple of places and one is a British import store. Lovely cake -- so simple and pretty. What a pretty cake! 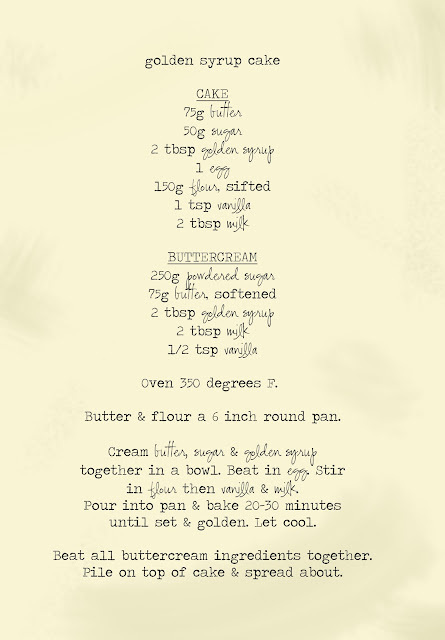 I've never baked with golden syrup, either, but now I must try it. I love the overall homey look of the cake--it's simple and pretty. Is that the jar that the Golden Syrup comes in? It looks so fancy!! I was so excited to find this recipe. My husband is on a special allergy diet but he can have this cake with only a few minor adjustments. Just pulled the cake out of the oven...flat as a pancake.....so disappointed. Next time I will try with S.R. flour and see if that helps. Golden Syrup is the best! Golden syrup dumplings were a dessert in every home in the 60's and 70's here in Australia. Serve with lashings of vanilla icecream. I LOVE golden syrup it's amazing on everything, especially strawberries. Looks like it would be deelish in a cake too! This looks delicious! I love the flavor (and color) of golden syrup. My husband and I lived in Australia for a couple of years, and I started buying it to use in place of corn syrup, which wasn't available there...I became hooked. Luckily I can easily find golden syrup here in NYC, so I continue to do that. Woooooo. This is insane. It make me so hungry! I wish I had read these comments before I made this cake. It needs self raising flour for sure, also possibly double the recipe. My cake didn't rise and turned out very heavy... still had a lovely flavour though. Amazing icing, it really makes it! I doubled this recipe, added about 4 tsp of baking powder and a little extra milk and it turned out well. I am in Australia too, 63 yrs of age, and golden syrup was used a lot, particularly in the Country Women's Association cookbook (reprinted again recently). Wonderful memories of golden syrup dumplings, custard, and if we were lucky and it was winter, separated cream on top. What type of font do you use to wrote the recipes? I know this question there's nothing to do whit the blog but I want to know cause is beautiful. I already print myself one of your recipes! I love the blog and your delicious recipes btw. What size pan would you use, I live in the US?